When it comes to soccer fans going crazy, you can't underestimate their how far their 'craziness' can go. 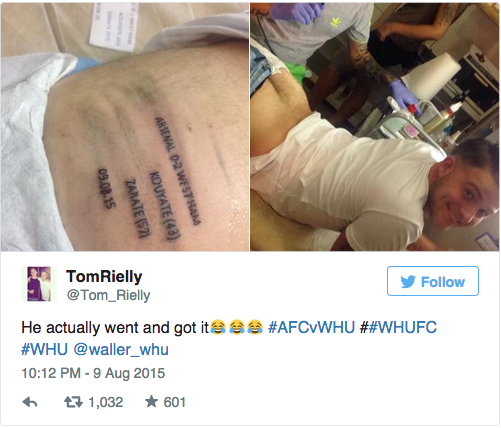 After Arsenal's first match which they lost to West-ham over the weekend, a fan decided to get a tattoo in an unlikely place to commemorate the historic win. He then went ahead and posted the photo on twitter just to prove how dumb he is. But what is even funnier is the reaction he got on twitter for the rather foolish thing.